Yemeni Jewish songs fall into two broad categories: those with religious themes, traditionally sung by men, and secular songs, through which women expressed the happiness and sorrow of their daily lives. 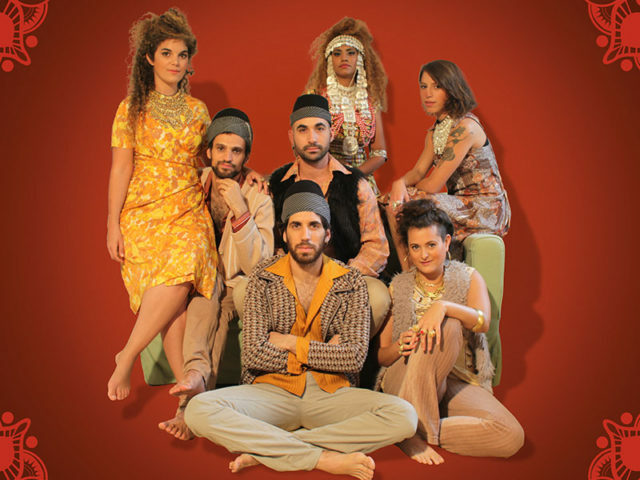 Jerusalem-based party band Bint El Funk, formed in 2012, initially took some of the YemeniJewish women’s songs and set them to a funk groove, a base they used to forge an eclectic sound influenced by music from around the world. The band, founded by vocalist Shiran Karny, has a loyal following in Israel and recently toured Ethiopia and India. Bint El Funk will be making its North American debut at the Revival Bar in Toronto on March 8. The group’s name has its origins in Karny’s childhood. “My father used to call me ‘ya binti,’ which means ‘my daughter’ in Arabic. When I grew up, I discovered the funk and the soul and fell in love. ‘Bint El Funk’ – the daughter of funk – is actually me,” she said via email. Bint El Funk’s sound is based on the love songs Karny learned from listening to female Yemeni Jewish singers like Leah Avraham and Gila Bashari. “Some of the songs are talking about passion from the point of view of a young single lady. Some of them are dealing with the pain of getting married against your will while your heart belongs to someone else,” said the band’s drummer, Regev Baruch, who met Karny when they were both students at the Jerusalem Academy of Music and Dance. As the band matured, the group created original material that’s influenced by Afrobeat, Israeli Mediterranean (Mizrahi) pop, Palestinian pop, Balkan music and even psychedelic Turkish music to create a funky Yemeni fusion. “Our sound developed over the years from the common work as a band, the influences of all the music that we love and grew up on and the inputs of the band members who came from different musical backgrounds,” Baruch said. Psychedelic Turkish music was played by Turkish musicians in the 1970s, combining psychedelic rock with classical Turkish music. Bint El Funk regards singer Selda Bagcan, an important voice of Turkish protest music, as their main influence from the genre. Bint El Funk mainly performs and records in a Yemenite Jewish Arabic dialect and in Hebrew. A few of their songs are in English or in a Palestinian Arabic dialect. Their first Israeli hit, Min Zaman, released in 2013, combined Hebrew verses with an Arabic chorus. The song compares the Israeli-Palestinian conflict to a painful love story. The band’s self-titled debut album was released in 2016 and their second album is on the way. Bint El Funk’s upcoming Toronto appearance – featuring Karny, Baruch, saxophonist Oded Ben Izhak, guitarist Gilad Levin, keyboardist Sharon Mansur and bassist David Hai Michaeli – is co-presented by the Ashkenaz Foundation and Small World Music. Part of Polyphonic Ground’s monthly concert series of culturally diverse music, the show is also the kickoff of this year’s Spotlight on Israeli Culture Festival. “The idea is to build an economy of scale and share knowledge and to advocate for our sector, which we feel is badly overlooked in the mainstream music scene,” said Ashkenaz artistic director Eric Stein, referring to the organization’s membership in the Polyphonic Ground, an umbrella organization for groups that present culturally diverse music. Two of the groups come together monthly to co-curate an event. “It’s exciting to bring together this new organization we’re involved with, Polyphonic Ground, with Spotlight on Israeli Culture, and at the same time have these connections where we’re taking Israeli music or Jewish music and putting it on a broader platform,” Stein said. When he heard Bint El Funk was going to be in North America, Stein said he thought they would be a perfect act to bring to Spotlight, as the music they play is quite accessible.